I was trolling through eBay the other day, browsing more than anything else, when I came across an auction for something like "Cleveland Indians Hall of Fame Set." Okay, I'll bite. What is a "Hall of Fame set?" Well, when I saw the photo, I knew I had to snag them up for my collection. Why? Because I had never seen them before! The cards are smaller than standard baseball cards, each measuring 2" x 3" overall. The fronts feature a parchment-style background with a player photo in the center. The photo sits in a diamond shape. The player's name and Indians seasons (in dates) appear at the top. At the bottom, the 2006 Indians stadium logo appears on the left. On the lower right, the Medical Mutual logo and "Official Health Insurer of the Cleveland Indians." Shown above are Ray Chapman, Al Lopez, and Al Rosen. The next three cards feature Addie joss, Sam McDowell, and Herb Score. I seriously question the term "set" as used in the auction's description because I cannot believe there would be a Hall of Fame tribute set without the team's greatest supporter: the late Bob feller. But, I could be wrong. 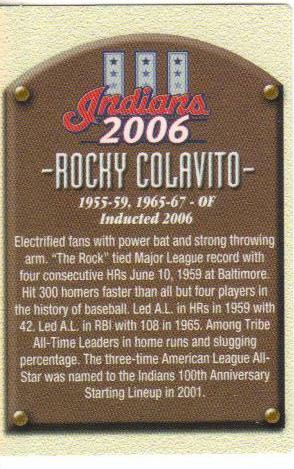 As you can see, the backs feature a plaque similar to the ones used at the Baseball Hall of Fame. Each card features the years the player was a Triber plus a write-up about him. I don't know how many cards are in the full set because I cannot seem to find anything about them anywhere online or in the few card almanacs I have. If I find out more info, I'll pass it along to fellow Tribe fans! I just found this post! I must have missed it while I was at the card show.We have that set.It was a stadium give-a-way. No Feller. I don't know why !! There are two Ray Chapman cards though. One version listed him as a pitcher instead of ss.We got both versions at the game that day. Other than being easier to access, online stores can save you time, money and potential embarrassment,https://canadianviagras.net/pill/viagra-canada/ whilst helping you to keep track of your prescriptions. While the Florida Metropolitan University has areas all through the province of Florida and offers programs in different popular health care callings. https://www.imedix.com/drugs/erectile-dysfunction/generic-cialis In any case, it's a pharmacy school as well as a balanced college that is outfitted towards being to-date with what the activity advertise is right now searching for in occupation competitors. advanced Bible interpreters (either by disregard or configuration) successfully annihilated any otherworldly association with taking medicine from a pharmacy. Presently who do you guess benefits the most from this goody of data? When I do feel something isn't right I will investigate characteristic health care before I converse with a specialist about remedy pills. In a retail drug store, drug store experts assume a comparable job that may incorporate checking data on a medicine,tadacip setting up the printed material or automated information for that solution, and setting up the prescription. Considering how many Australians rely on medications to live their lives, it's remarkable - and concerning - viagra how few of them actually worry about whether or not the pharmacy they frequent is accredited. With drug and medicines administration,learn here there are illegal firms that operate without following the stipulated drug administration ethics and the law set to protect consumers. Reckless sale of medicines and medical drugs Puts consumers at risk. The present lifestyle for everyone has become more hectic, and even they do not have much to shop for some medicine. For those people,https://www.kamagraperth.com/ these online stores will be definitely helpful. But since Company B didn't spend on the innovative work of their conventional prescription, they're ready to showcase the items at a lower cost. this content Online drug stores generally move these. eTopps T-206 is back. Excited? 30 Clubs in 30 Days - The Heart of Rock-n-Roll? Is Acta honing the Hafner Axe?